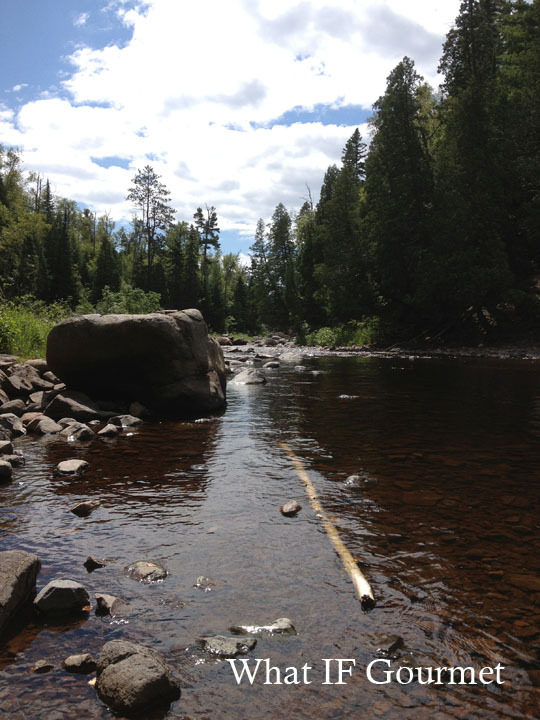 Gooseberry Falls State Park, MN. 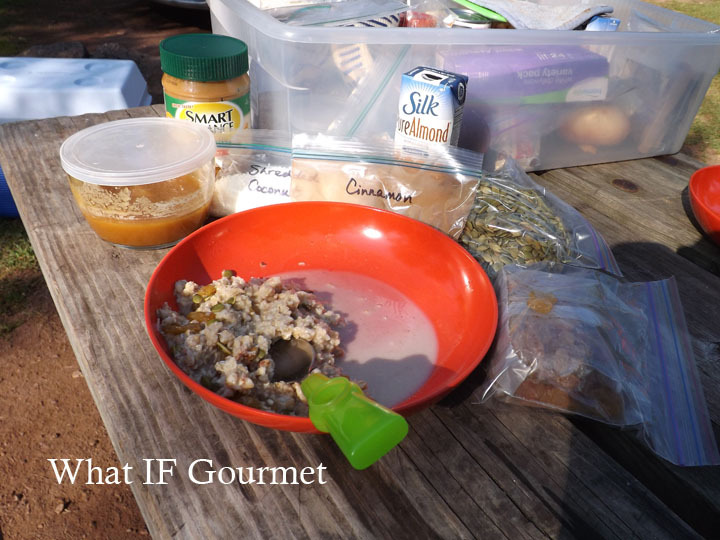 At first, packing a gluten-free, anti-inflammatory camp pantry for a week-long camping trip in Minnesota seemed a bit daunting. 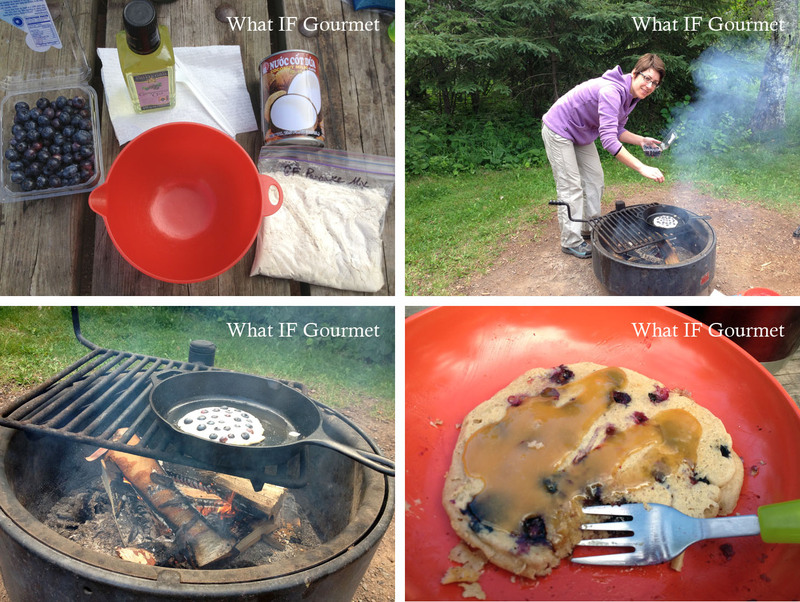 Then I really thought about it, and realized that a lot of what we eat translates fairly well to cooking over a campfire. 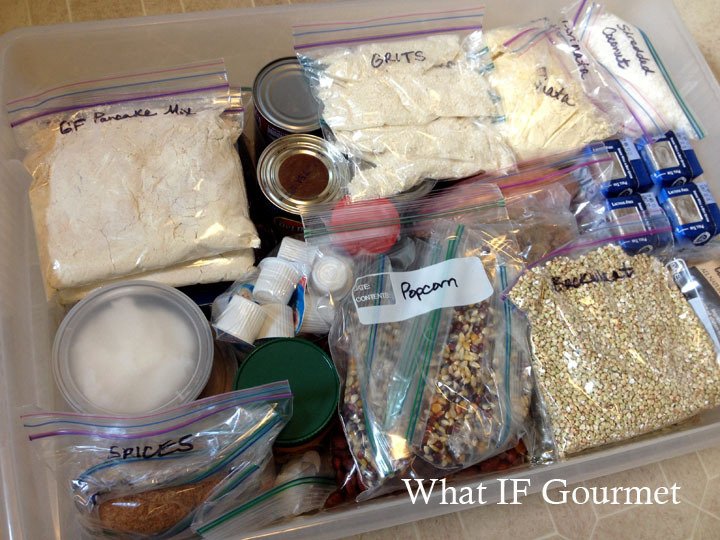 Here’s what my dry-goods camp pantry looked like, all packed up and ready to go: cans of beans, diced tomatoes, and coconut milk; shelf-stable mini-cartons of almond milk; gluten-free instant oatmeal packets (plain); portioned-out baggies of grits, coffee, popcorn, and my homemade gluten-free pancake mix; baggies of spices; sweet potatoes and onions; organic buckwheat groats; peanut butter; a small container of coconut oil; a small bottle of grapeseed oil (its high smoke point makes it great for cooking over a campfire); raw buckwheat honey; and some bulks items equally good for snacking or for topping oatmeal: tamari-roasted almonds, pumpkin seeds, shredded coconut, golden raisins, dark chocolate chips. The little cups of non-dairy creamer don’t belong in an anti-inflammatory diet, but they are my concession to the Gent. He has willingly and graciously changed his diet dramatically on this journey by my side, so the least I can do is leave his coffee ritual unperturbed. In our cooler, I packed broccoli, carrots, hummus, apples, peaches, blueberries, fresh dates, and frozen baggies of ground turkey and chunks of chicken, which I had cut up before freezing. What camping trip is complete without a breakfast or two of hearty oatmeal? We topped ours with cinnamon, peanut butter, raisins, pumpkin seeds, shredded coconut, buckwheat honey, and a splash of almond milk. Every morning, the Gent used his fancypants Jet Boil and accompanying Java Press to make us strong, hot coffee in no time. We were drinking an Ethiopian brew that we picked up on a recent jaunt to Maine — coffee is one of our favorite souvenirs to bring back from a trip. While oatmeal is a reliable workhorse breakfast, blueberry pancakes with buckwheat honey made some breakfasts a little more special. I portioned out my homemade gluten-free pancake mix in baggies before the trip, and then mixed it up with coconut milk and cooked the cakes in a cast iron skillet greased with coconut oil. Another morning, I used the pancake batter and tried my hand at an impromptu blueberry (and peach) buckle in the cast iron Dutch oven. 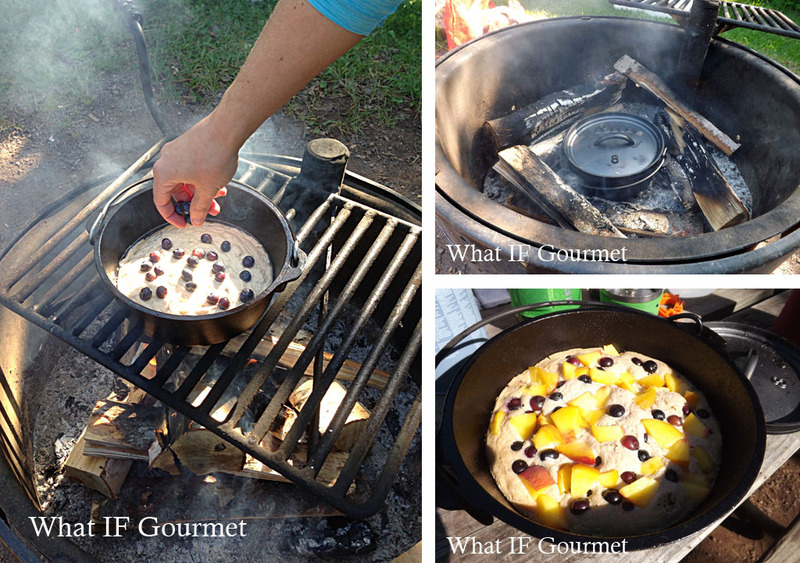 I mixed up the batter, poured it into the greased Dutch oven which was already heating over the fire, and studded the top of the batter with blueberries and chopped peach. After covering the pot, I nestled it among the coals to “bake.” Even without the traditional rubbed butter and brown sugar topping, this makeshift buckle would have made an equally delicious dessert or breakfast. My least successful dinner endeavor proved to be foil packets of seasoned chicken and vegetables cooked over the campfire. Our wood was wet the first night, and we had some trouble keeping the fire lit, so I kept envisioning opening the packets to find semi-raw chicken. As a result, I overcooked the meat to the point of toughness, and some of the vegetables charred. I know some folks have great luck with this sort of packet meal, but I prefer dishes that I can monitor more easily as they cook. Turkey chili warmed us up after a day of hiking followed by lounging in the camp hammock (an anniversary gift from the Gent) with a good book. I cooked the chili in my cast iron Dutch oven, forgetting that the acids in tomatoes can strip the seasoning from cast iron. My pot weathered this test just fine, but it’s something to keep in mind when planning which cooking implements to bring on a trip. For this simple chili, I heated grapeseed oil in the Dutch oven over the fire, then browned the ground turkey. I then added chopped onions and sauteed them until translucent. A can of drained and rinsed navy beans, a can of diced tomatoes, and a heap of spices — which I had portioned out ahead of time in a “chili seasoning” baggie — went in next (salt, cumin, smoked paprika, hot red pepper flakes, thyme). After a few more minutes of simmering over the fire, dinner was ready! Using a box of Imagine brand creamy portobello mushroom soup (gluten-free, vegan, non-GMO) as a base, I added garlic, onions, broccoli, sweet potato, and buckwheat groats for a hearty vegetable soup. Looper, our Vizsla (who is photo-bombing the above left photo), seems skeptical of a meal without meat, but the soup was flavorful and satisfying. 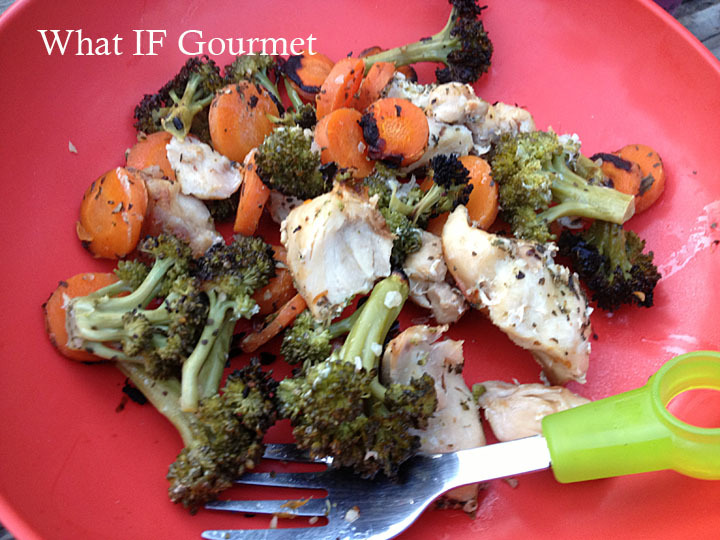 This brightly colored dish combined some of my camp pantry staples in a new way. I simmered red onion, black beans, buckwheat groats, diced tomatoes, chopped sweet potato, and green bell pepper with dried herbs and spices to make a texturally interesting and nutritiously diverse stew. Since s’mores are off my anti-inflammatory menu thanks to their outrageously high sugar content and gluten (alas), my favorite evening campfire treat has become popcorn. 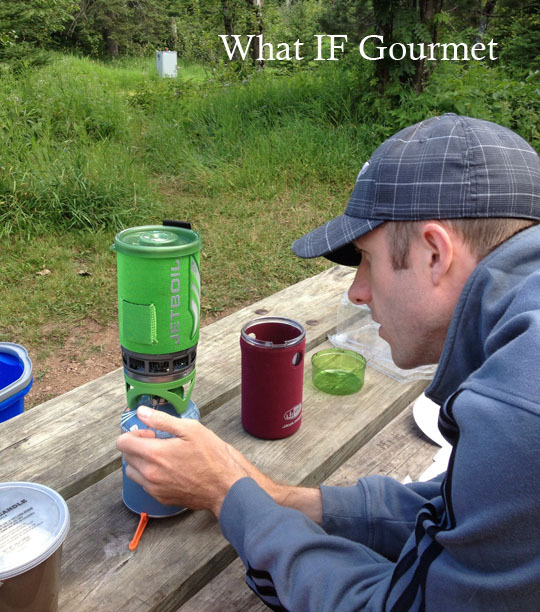 I was amazed by how effectively my new “Shake & Pop” campfire popcorn popper worked. 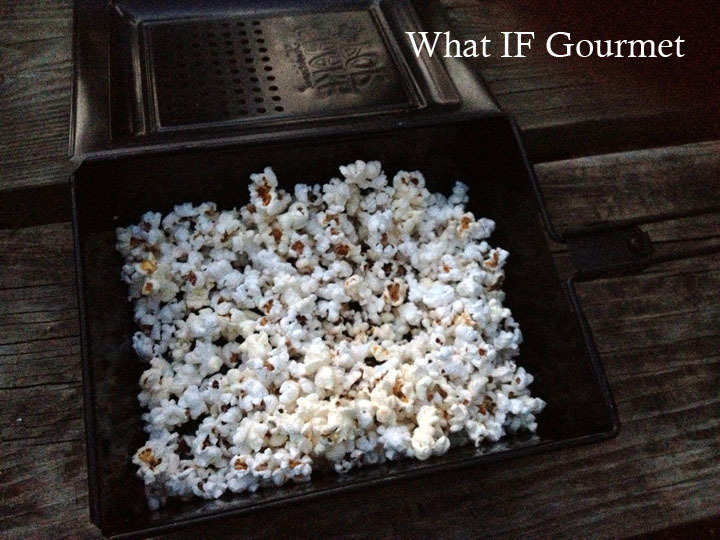 We had a bowlful of hot, crunchy popcorn ready in mere minutes, and not a single kernel burned! 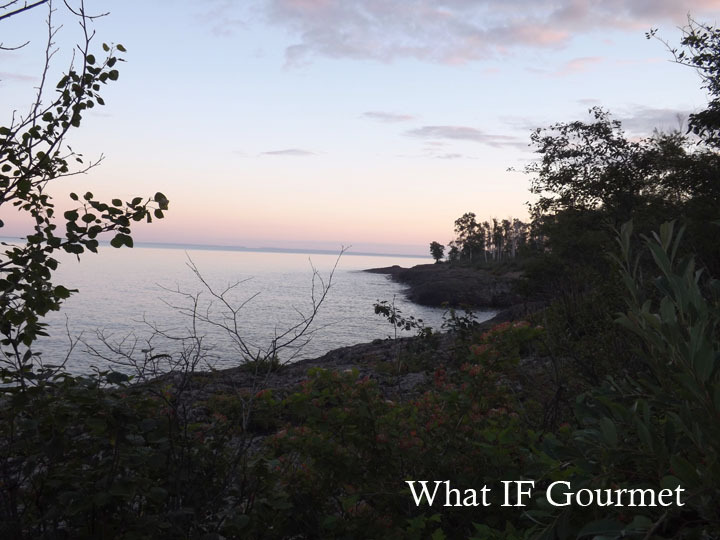 This entry was posted in alliums (garlic/onions), Anti-Inflammatory Ingredients, Breakfast, Camping, chile pepper, coconut oil (virgin/ unrefined), cruciferous vegetables, Dairy-free, dark chocolate (70% cocoa or more), Domestic, Entrees, Events, fruit, Gluten-free, legumes, monounsaturated oils, nuts, seeds, Snacks, spices, Travel, Vegan, Vegetarian. Bookmark the permalink. I love how simple you’ve made this seem!! 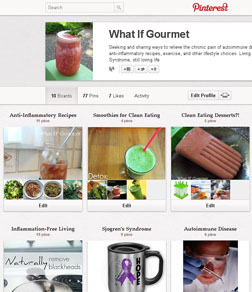 You’ve made the Anti-inflammatory diet easy to do in any location under any circumstance. Love it! !